In classical Roman tradition a genius loci was the protective spirit of a place. This concept leads the architecture that mimics the events at it’s surroundings, the nature, vernacular architecture, etc. To blend is the rational sustainable concept to exist without causing a disturbance.Nowadays most of the sustainable architecture strives to produce energy regardless of the economic costs and resources, becoming buildings covered with items that protect them from heat, from cold and others who strive to create energy. Those buildings needed engineering to be completed, to be “eco-friendly”. What if the building could protect himself? What if its own architecture was blending so good with its environment and surrounds that is not worth the effort to produce energy? To create maximum flexibility the market is set up with modules, combining this modules merchants can obtain different stalls depending on their needs. This modules can be piled up or stored in the based because its size fits in the lift. The construction is based in “Cradle to Cradle” concepts and imitation of vernacular architecture. So the use of materials from the area and local techniques will save transport and construction costs. The main volume will be build like the old cisterns, using a material based on neighbor recycled demolition materials reinforced with steel. The shape, structurally efficient will save material, protect from direct sun and provide thermal mass. Add the same time this majestic shape gives notoriety as a public market. 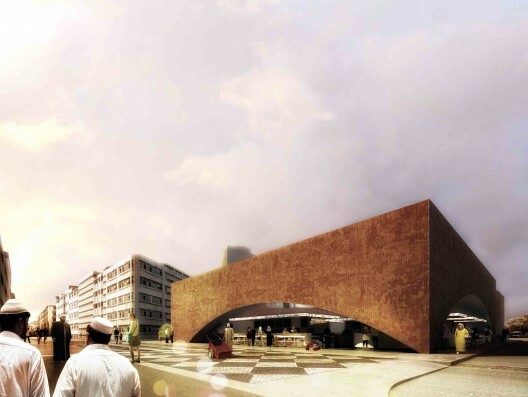 One of the main points of this building is its cistern at top level, not only for its sustainable contribution but for its extra-potential addition to the building functions, it will act as attractor point for all Casablanca citizens, creating new commercial opportunities in the neighborhood. The water accumulated in the building provides isolation to the building and creates new areas for flora and fauna. This water provides from direct rain collection and neighbor roofs, will be used in toilets and market hall for cleaning purposes, due to the level difference it won’t need any energy to be pumped. In conclusion the building results of the mix of traditional market interpretation, vernacular architecture and sustainability as result of using what nature and rationality offers. The images of this project has been exhibited at MoMA New York as part of the exhibitioncut'n'paste.